The Global Volcanism Program has no activity reports for Copiapó. The Global Volcanism Program has no Weekly Reports available for Copiapó. The Global Volcanism Program has no Bulletin Reports available for Copiapó. Volcán Copiapó in Atacama province SW of Nevados Ojos del Salado volcano is a dominantly Miocene-Pliocene stratovolcano. Eight andesitic pyroclastic cones are located primarily on the SE flank of the 6052-m-high volcano. 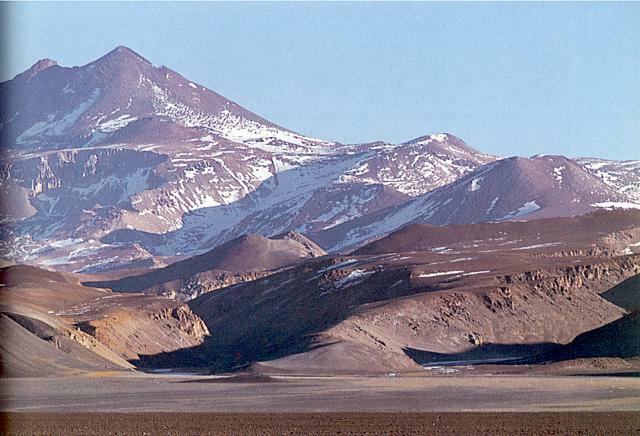 The most recent cone, Volcán San Román, lies 7 km north of Copiapó and was considered to be of probable Pleistocene age, related to late-stage reactivation of Pleistocene-Holocene fissures cutting the Ojos del Salado region (González-Ferrán, 1995). This dacitic-to-andesitic volcano was reported by Von Wolff (1929) to display solfataric activity. Gardeweg M C, 1993. (pers. comm.). Von Wolff F, 1929. Der Volcanismus II Band: Spezieller Teil 1 Teil Die Neue Welt (Pazifische Erdhalfte) der Pazifische Ozean und Seine Randgebiete. Stuttgart: Ferdinand Enke, 828 p.
The Global Volcanism Program is not aware of any Holocene eruptions from Copiapó. If this volcano has had large eruptions (VEI >= 4) prior to 10,000 years ago, information might be found on the Copiapó page in the LaMEVE (Large Magnitude Explosive Volcanic Eruptions) database, a part of the Volcano Global Risk Identification and Analysis Project (VOGRIPA). There is no Deformation History data available for Copiapó. There is no Emissions History data available for Copiapó. The Global Volcanism Program has no photographs available for Copiapó. There are no samples for Copiapó in the Smithsonian's NMNH Department of Mineral Sciences Rock and Ore collection. Large Eruptions of Copiapó Information about large Quaternary eruptions (VEI >= 4) is cataloged in the Large Magnitude Explosive Volcanic Eruptions (LaMEVE) database of the Volcano Global Risk Identification and Analysis Project (VOGRIPA).